On August 31st I was sitting at my Macbook Pro with Safari, Firefox and Chrome web browsers open. Every couple of minutes, I was refreshing each. Earlier in the day I had my Iphone set to give me multiple warnings that I had to be home in front of my computer no later than 8pm Eastern time. 30 minutes to go and I am getting eager, but impatient with each browser refresh. For weeks I have been following multiple websites and reading each rumor and speculation with the occasional official update to tide me over. No one could blame you for thinking I was waiting for release night to order the latest Iphone. No, not this time. This night's commodity is highly coveted and, with an inventory of only 400 units, just as hard to get on opening night. I was lucky enough to be able to complete an order for one of the new Csspecs Vepr 12 magazines. The 400 magazines that were available on release night were sold out in less than a half hour. It's hard to imagine a firearm accessory that would read like this. So what makes these magazines so special? There are several reasons and each purchaser could justify buying these magazine for any of them. President Obama in his wisdom has chosen to push Russia for its Ukraine transgressions by banning the importation of small arms in to the U.S. The firearms industry was just at the point of becoming normalized again after Newtown. With these new sanctions the price of Russian hardware has again become insane. What was a $799.00 shotgun a month ago has now almost doubled. The price of factory Molot magazines has followed suite. What was already a hard to get magazine, is now even harder and more expensive. Do not expect to get any factory higher capacity magazine for under a hundred dollars. There are more readily available magazines that are made in the U.S. But they are only available from what can be called second tier manufacturers. You can read reports of questionable reliability and loose tolerances with construction throughout the internet gun forums. Add in the insane cost of these magazines and you are left wanting more. There is the chance of modifying readily available and reliable Saiga magazines but that does not always work and the consumer may not have the expertise to sort it all out. Most of the Vepr 12s imported just before the ban have the capability of a folding stock. But for importation as sporting arms these Vepr 12's had to have the stock welded so that it could not be folded. Essentially If you want to be able to break the weld and fold the stock you have to add enough U.S. parts to still qualify the Vepr 12 as a sporting arm called 922r compliance. You can read more about it at Tapco's website on 922r. My initial order was placed the night before Labor Day. Csspecs was smart to do this thereby allowing them an essentially free day for order processing and packing. When most everyone else was enjoying their relaxed holiday, I can imagine the folks at Csspecs busy laboring away packing and shipping out orders. I was impressed that they had my magazine packed and ready to ship on September 1, and they had sent me my tracking information. On Tuesday the wait began as my magazine made its way from Florida to Alabama. I had already been impressed with the speed in which my order shipped and in the communication by Csspecs. Thursday came and so did my magazine. You would think with a large influx of orders in such a short period of time that orders would have been rushed and just quickly shoved in a box. That was not the case at all. Above you can see all five separate layers and how well my magazine was packed. There was no way my magazine would be damaged or rust during its transit to me. There is only one word that describes the Csspecs magazine--quality. The Molot factory and its engineers should be envious of the build quality of these magazines. In my opinion, this is what the factory magazines should have been. And you can't even begin to compare them to the second tier manufacturer magazines. In a time when even the second tier manufactured magazines can sell for triple digits, it is a true sellers market with plenty of buyers. What impresses me the most is that these are some of the best magazines made for the Vepr 12, and they are also some of the cheapest higher capacity magazines for the Vepr 12. Above is my version of the adjustment guide included with the Csspecs Vepr 12 magazine. The paper work says the following. "Thank you for buying our new steel Vepr-12 Magazine. First thing you will want to do is confirm lock up. This magazine has slightly less lower contact than a Molot poly magazine and may have slightly more movement side to side. A basic fitting guide is provided. If you encounter any problems please contact us at sales@csspecs.com with the Subject "Vepr fitting"
It is important to note that it is possible to catch the last round bolt hold open device inside the shotgun in the magazine if tipped towards the back. 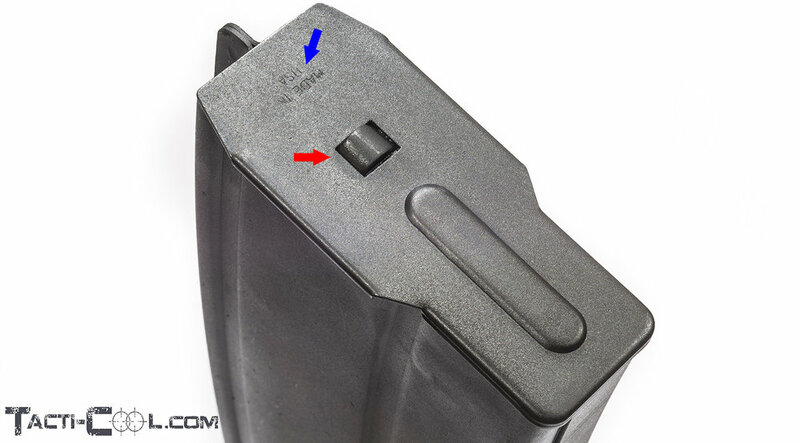 The rear catch on the magazine has a relief cut that allows the magazine to tip further than the factory magazine. Insert the magazine while slightly tipping the top toward the muzzle and the bottom toward the stock. We suggest opening the top cover and observing the shell patch and the amount of force needed to insert the magazine normally. We also suggest loading only 8 shells for initial testing. Thank You." The only negative I could find with this magazine is that the "Made in USA" stamping is shallow (blue arrow 1st picture above). Csspecs, be proud and stamp it like you mean it. How about adding your name to the magazine in the future. I want to be able to show you guys off. Disassembly is easy. Just push the locking tab down (red arrow 1st picture above) below the surface of the base plate. Then slide the base plate towards the front of the magazine. Be careful and use your hand to cover the bottom of the magazine as you remove the base plate. The spring is under tension and will pop out with force. Next pull the locking tab, spring and follower out and you have fully disassembled the magazine. 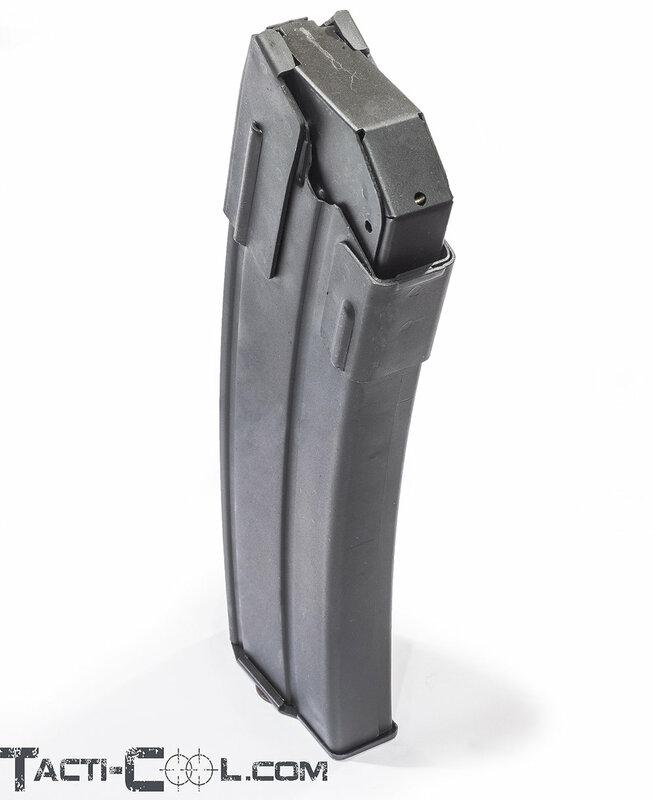 Only five metal parts make up the magazine with no cheap plastic parts or short cuts to be found. The follower is essentially sheet metal origami. What looks like one single sheet of metal that has been elegantly folded and welded into shape. From the looks of the spot welds you will never have to worry about it loosing its shape. Hidden inside the magazine is a nice molded track for the follower to ride in. There are no sharp protrusions or defects for the follower or spring to catch on. It is nice and smooth throughout. In the third picture, you can see how the follower rides in its track with no chance that it can ever nosedive or get out of alignment. The back adjustment locking tab is a solid piece of metal that has been welded to the body of the magazine multiple times. This beefy piece of metal just gives you the confidence that your magazine will give you a lifetime of use. The magazine's weight when empty is right at 1 pound 2 ounces. I am not going to say this is a con since it is a fully metal magazine with thick gauge sheet metal thoughout. The last round bolt hold open tab positively touches the follower on an empty magazine. I have used my Vepr 12 and the Csspecs magazine in a couple of Trap matches and fired a couple hundred rounds down range with no problems. The match director felt sorry for me having to load one round at a time, so I was allowed to load five rounds at a time. It was a practice match so no one gave me any trouble about it. You will have to take your time and make sure you practice loading. I found that going straight in at no tilt front or back gave me the most consistent results while locking the magazine in place. If I tried to force the magazine at an angle, I could feel the magazine not want to lock in place. I quickly learned how to feel it into place. When properly inserting on an open bolt there is little resistance. The Csspecs magazine was the first accessory I have purchased for my Vepr 12 and is just the beginning of the process. Of course I want to cut my weld and un-neuter my shotgun so I have some other American made parts on the way. From Carolina Shooters Supply I have a gas puck and chaos hand guard rail coming . Since I am a dealer I ordered an Arsenal US Saiga 12 Trigger pack, Magpul AK pistol grip, Magpul AFG1 angled foregrip from one of my distributors. Next on my wish list is the Carolina Shooters Folding M4 stock adapter and then one of the Magpul stocks. I just need them to hurry up and release the adapter. My other wish would be a nice metal magazine well for the Vepr 12, the plastic one is ok, but can be made better. If only there was a company that was really good at bending and welding complex metal shapes. Csspecs, I challenge you to make a mag well. I will be the first one in line to buy one. Unfortunately at the time I could only purchase one of these magazines.....I had bills due on the first. Csspecs had mentioned about three weeks until the next batch of 1000 magazines. As soon as I get the email with a definitive date, the cycle will start all over and I will be refreshing my web browser to get my next 4-6 magazines. For those that missed out in the first batch, I can tell you it is worth it to treat yourself to these magazines. And you get the bonus of adding to the US parts count on your Russian import so go ahead and cut that weld. As I said before these are the best Vepr 12 magazines made and some of the cheapest available so it is stupid not to buy these.